Oba of Lagos denies snubbing Ooni of Ife at public function – Royal Times of Nigeria. Oba of Lagos, Rilwan Akiolu, has denied snubbing the Ooni of Ife, Oba Adeyeye Ogunwusi at a public function some days back. 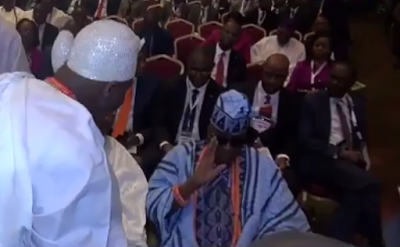 A video made rounds on social media showing the Oba of Lagos responding to the greeting of the Ooni of Ife in a rather unfriendly manner. Many Nigerians reacted to the video, calling out the Oba for being rude to the Ooni who is believed to be the most superior monarch in Yoruba land. The Lagos Monarch, speaking through one of his white cap chiefs, Lateef Aderibigbe Ajose said he did not ignore the Ooni of Ife at the public function as being interpreted by many Nigerians. Lateef who spoke to newsmen at the palace of the Oba in Lagos, said the manner in which the Oba greeted the Ooni is the culturally acclaimed way of greeting by a monarch in Lagos and that the Oba of Lagos was only trying to revive that culture which according to him is going extinct. He said; “The sign by Oba Akiolu signifies, ‘inu mi, inu e’, the culture of greeting in Lagos. If Oba Akiolu wanted to ignore, he would have turned his face away from Ooni. There is no misunderstanding between both highly revered Monarchs in Yoruba Land. Oba Akiolu was well represented at the coronation of Ooni of Ife, which attested to the fact that he does not disregard the office of Ooni Adeyeye. There is no sentiment in the culture of Lagos. As we met it that is the way we are doing it. Kabiesi Oba Akiolu is trying to bring back the old pattern, the old culture we have left behind. What happened that day was wrongly speculated by the social media to disrupt peace and order and misinterpret Oba Akiolu’s action. We just want to appeal to the social media to stop spreading wrong information. They should try and understand the reason behind every action carried out most especially by traditional rulers. Yoruba has a very rich culture. There is no quarrel between the Oba of Lagos and Ooni of Ife”.